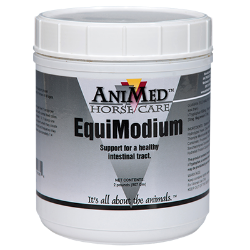 A proprietary nutritional blend designed to support proper digestion and bowel health for horses of all classes and ages. The easy-to-feed powder helps maintain a normal healthy intestinal tract. Use only when needed. *This product contains l-tryptophan, which may be prohibited in certain competitions. Take caution when using on a competition horse subject to drug testing. Check with the event sanctioning body for the necessary withdrawal times.